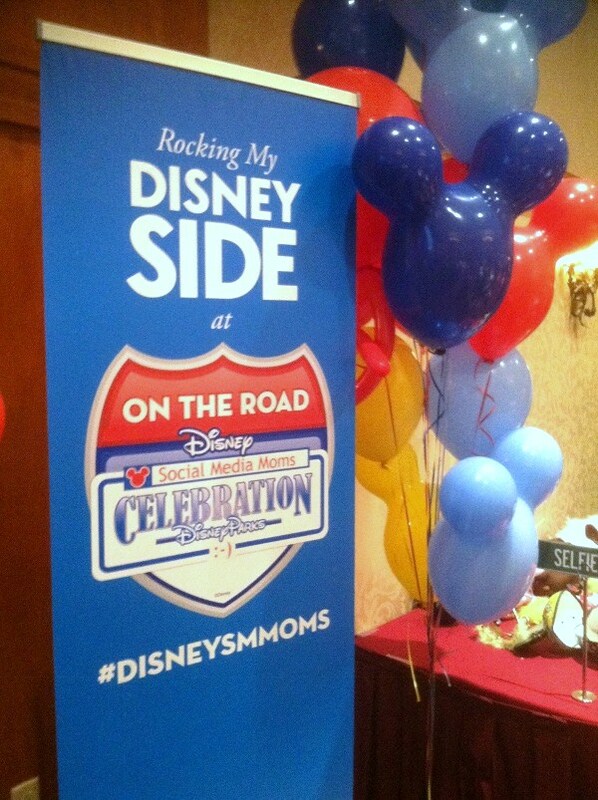 Terri and I were so excited for the amazing opportunity to attend this year’s Disney Social Media Moms Celebration On-the-Road. Not just anybody can go. First, you need to complete an application. Then you wait for an invitation. Annnnnnd, we got one! Score! This event is held once a year. 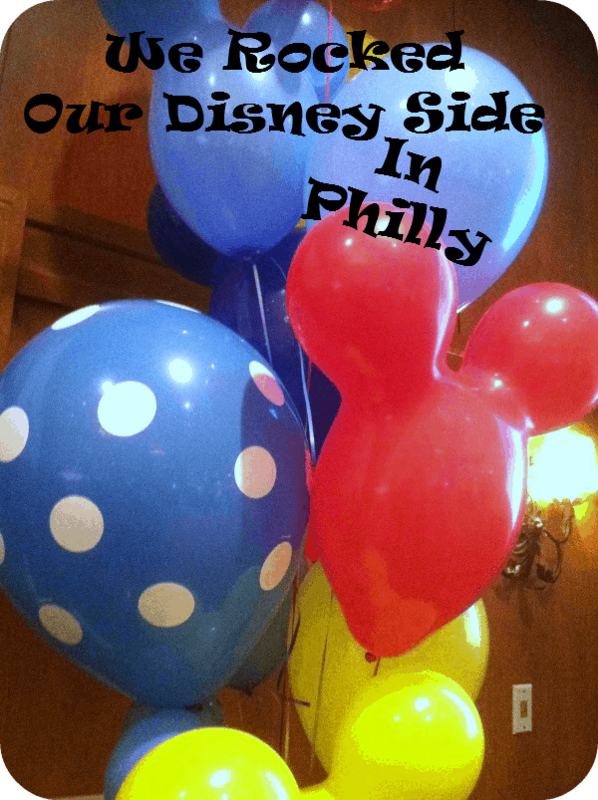 This year it was held in 3 different cities – Chicago, Philly, and Phoenix. Luckily for us, Philly is only a 2 1/2 hour drive from Frederick, so we chose Philly. 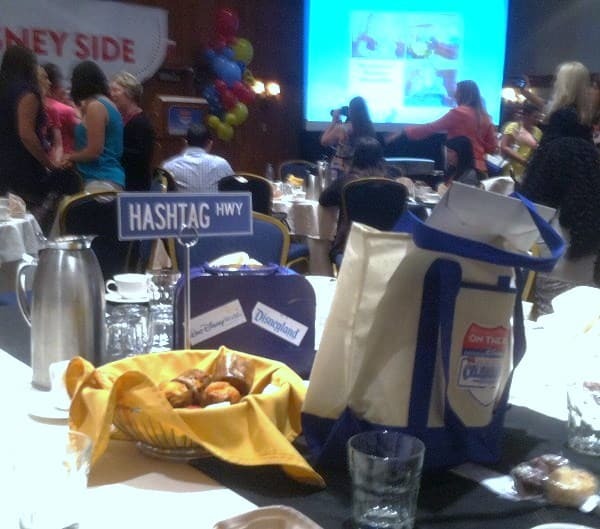 This was our very first social media/blogger conference. Stepping out of our comfort zones, we were pretty worked up and actually nervous about this event. But we were also very excited to see what all of the hoopla was all about. As we found out, it lived up to all the hype. If the above picture was any indication of how this day would go, we were in for some fun! Yes, those are Maleficent headbands these ladies are wearing. 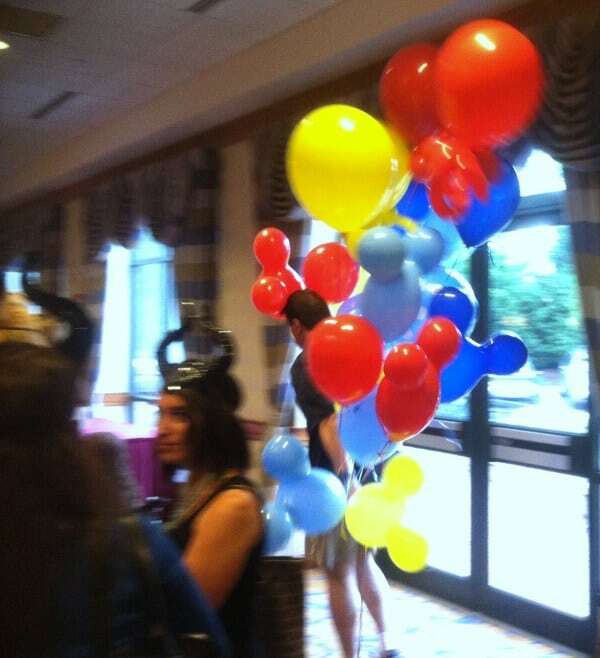 And how cool are those balloons? 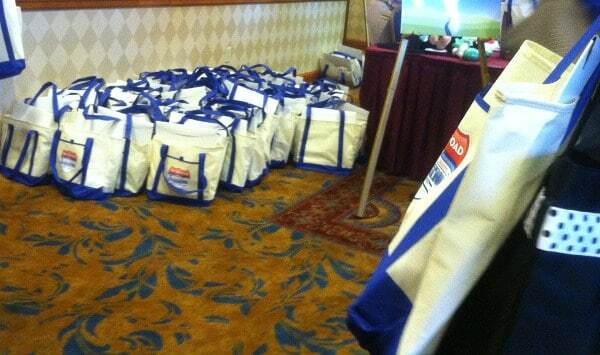 As Terri and I walked into the registration area, we saw these ‘swag’ bags awaiting each attendee. Eeeek!! Who doesn’t love receiving some swag? Walking into the conference room, we knew we were going to feel right at home. Everybody had their mobile devices at-the-ready. If you’re not a blogger, you might not understand that looking down at your mobile device while listening to a speaker is not rude at all. This is one case where it is expected. 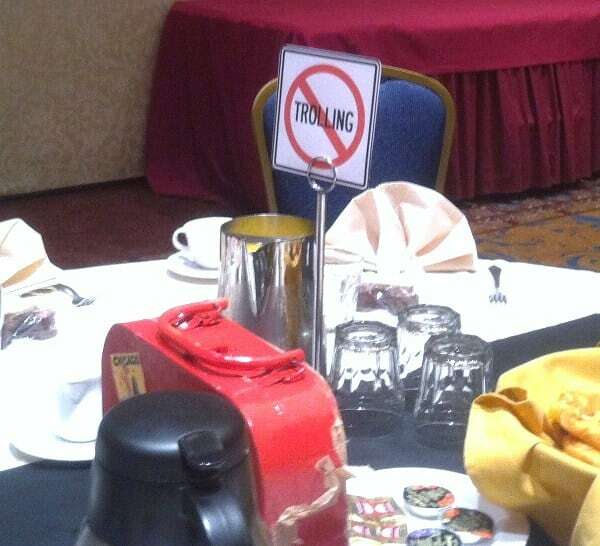 Each table had it’s own social media themed sign. 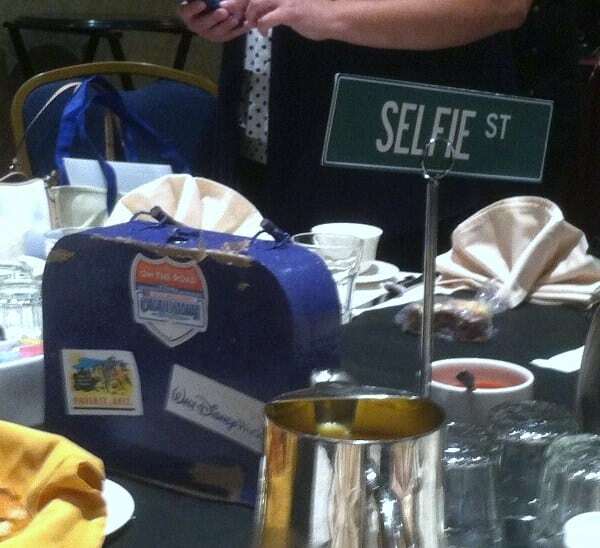 Selfie Street was our fave! So why not start with a selfie! 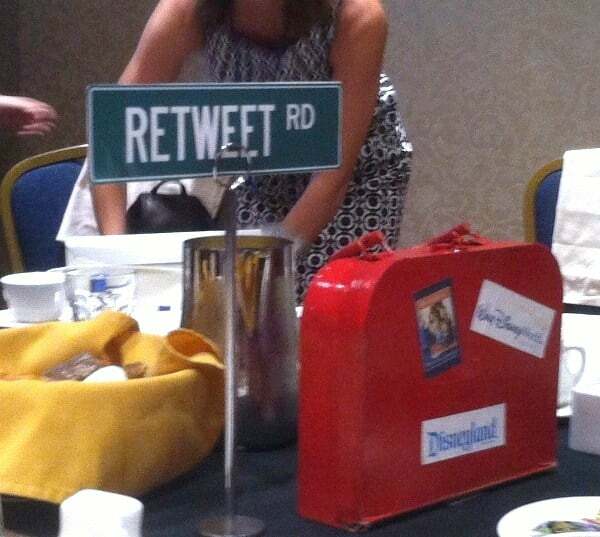 Then there was Retweet Road. They fed us well. Muffins and danishes and plates of quiche with hash browns and fruit. Very good. And coffee!! Gotta have my coffee. 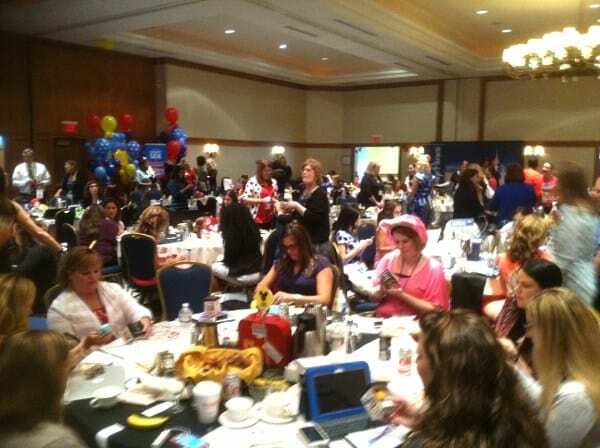 Everybody got a chance to mingle and walk around the conference room to peruse all of the fun things throughout. This table had all of the prizes that were given out throughout the morning. 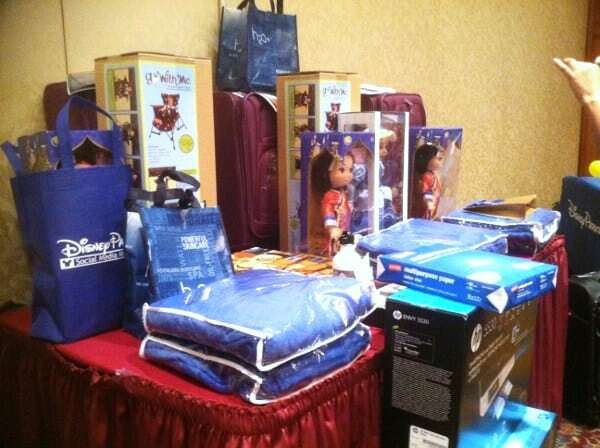 Attendees won blankets, Disney dolls, tote bags, HP printers, luggage, and more. It was awesome. I didn’t win anything, but was okay with that. 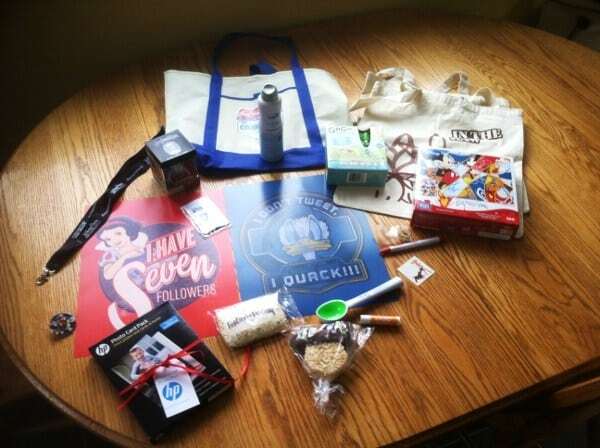 I was happy with my swag bag and all of the networking and presentations that were taking place. 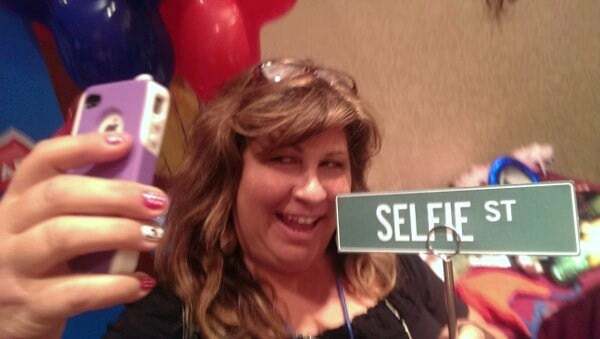 And you can’t have a fun conference without props and photo opps! 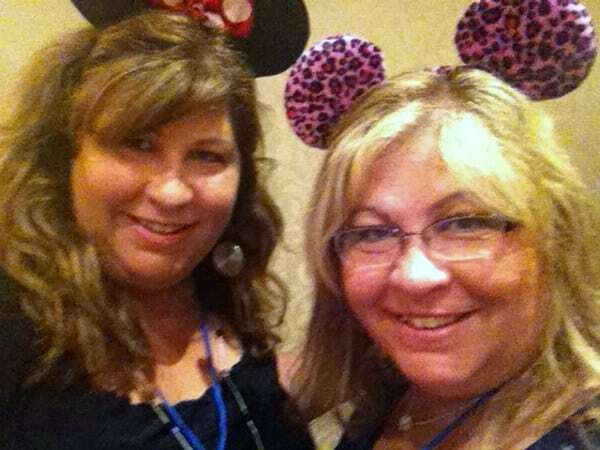 Yes, we’re grown women, but who can resist putting on some Minnie Mouse ears! Aren’t we just the cutest? Rockin’ our Disney Sides baby! 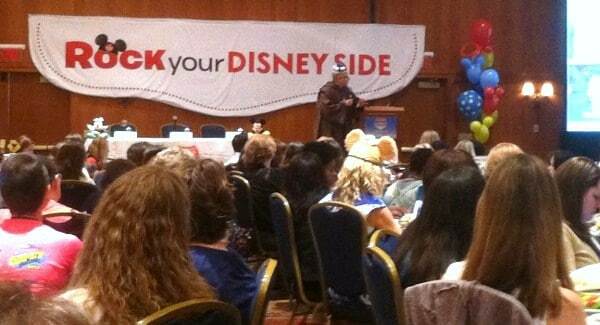 So the theme of this conference was ‘Rock your Disney Side’. 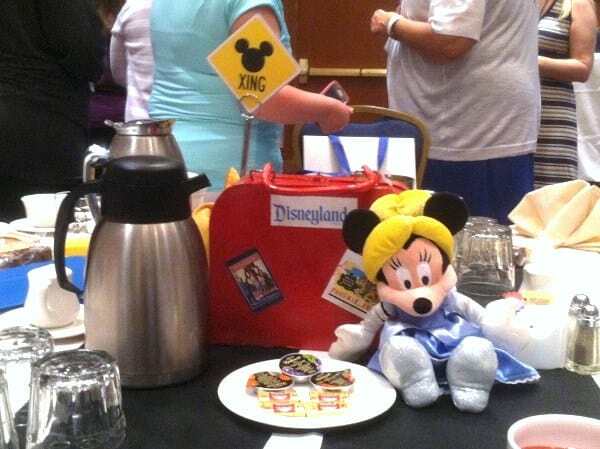 The organizers asked us before the conference to email a picture showing our Disney Side. They had a slideshow up on the screen showing all of the attendees’ submissions. So fun! Maria Bailey, Owner of BSM Media and Mom Talk Radio – She said to look at the whites of your child’s eyes when you are speaking to him/her. Keep doing it until it becomes habit. This helps you to be present with your kids. 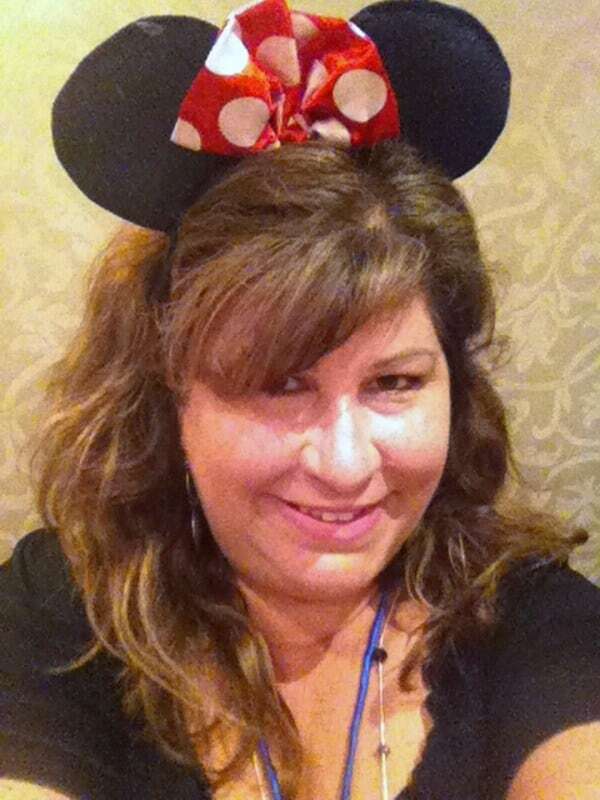 Jamie Langdon, Walt Disney World Public Relations & Social Media – Jamie was so sweet and made all of us feel very welcome. She shared how much fun she has working for Disney. 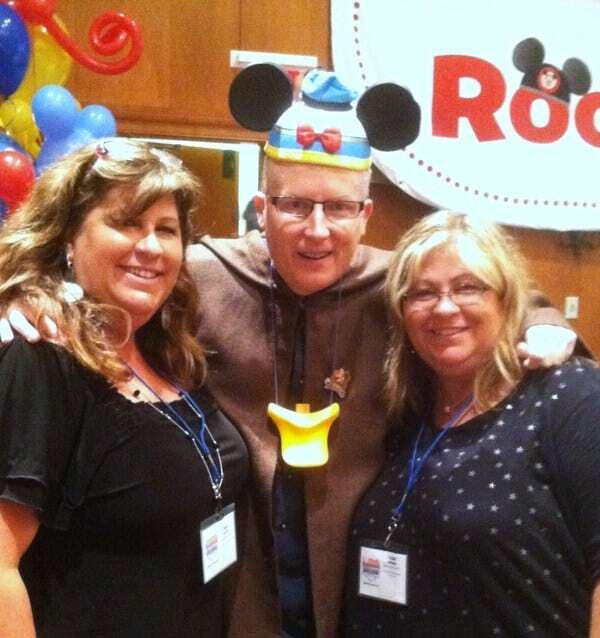 Gary Buchanan, Walt Disney World Social Media Managing Editor – Gary gave us the scoop on the latest and greatest Disney World has to offer, including Diaper Dans showing their Disney Side and Disney’s ‘Be the 8th Miner’ contest. 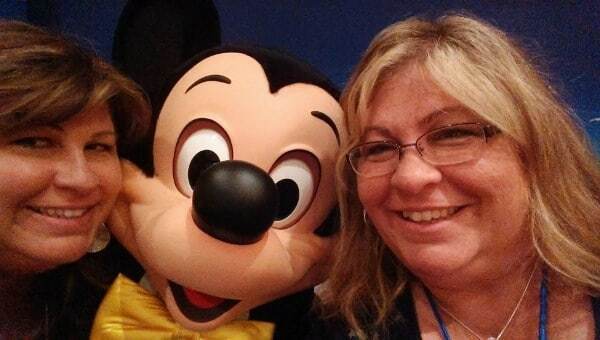 Jenn Fickley-Baker, Walt Disney World Social Media Manager – “Chase an idea if you’re looking for good content”. She gave an example of this: Disney’s 24 Hour Party was publicized using 140 Disney characters formed in the shape of an enormous hashtag. It was a hugely successful campaign. 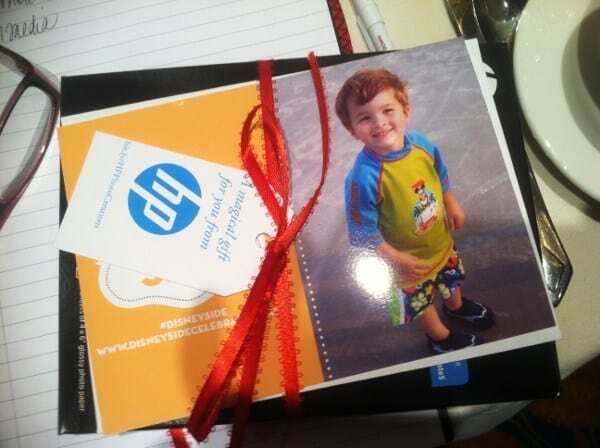 Noah Lomax HP Product Marketing Manager – He showed a couple mom videos demonstrating Twosmiles.com, Print-at-Home Gifting and Greeting Cards, #HPSmartMom and HP Photo Creations. HP offers a program that automatically detects when your HP printer is low on ink and ships you the ink before it runs out. What, WHAT? AND the ink is cheaper than buying it at an office supply store. Sign me up! You can also print something to your HP printer from your mobile device when you’re not even home – like your child’s homework that they forgot to bring home. HP totally knows what they’re doing when it comes to helping out busy moms. Victoria Lim, Walt Disney World Managing Editor and Public Relations – She gave great tips on maximizing your mobile, as well as the latest and greatest gear and apps. Her tips were spot on and very helpful to the everyday blogger. Some Amazon affiliate links are included in this post. If you click on them & make a purchase, I will receive a very small percentage – like a few cents. However, this does not affect the price you pay or my opinion on these items. 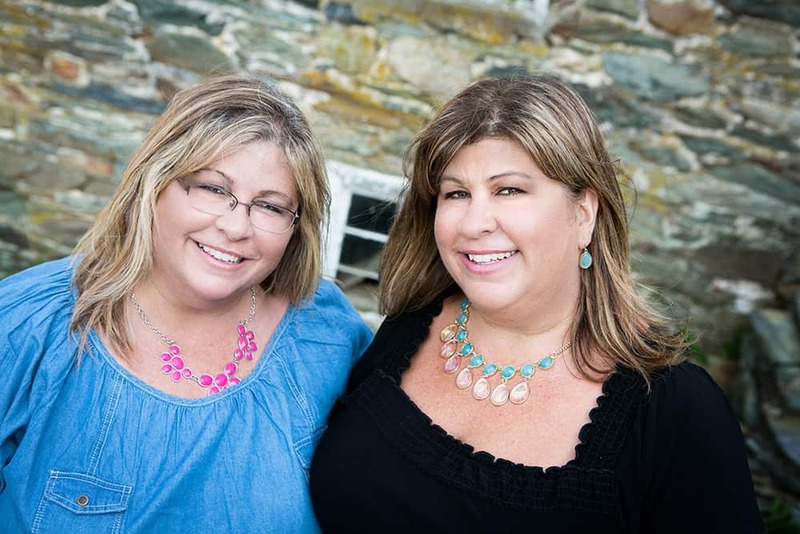 Kristi Gorinas, Inventor of DadPack – She stressed that failure contributes to success. Jen Groover, Inventor of Butler Bag – Delegate things you’re not good at. Patents are very important. Network. Partner for financing. Licensing is a powerful business option. “Have more fear of regret than you have of failure”. Debi Silber, Author and Founder of The Mojo Coach – Your mindset is your belief system, which is no more than repetition of an idea from someone you trust. Take on your limiting beliefs and create new thoughts. Had to get a shot with the man with a plan, Gary Buchanan! He was awesome. 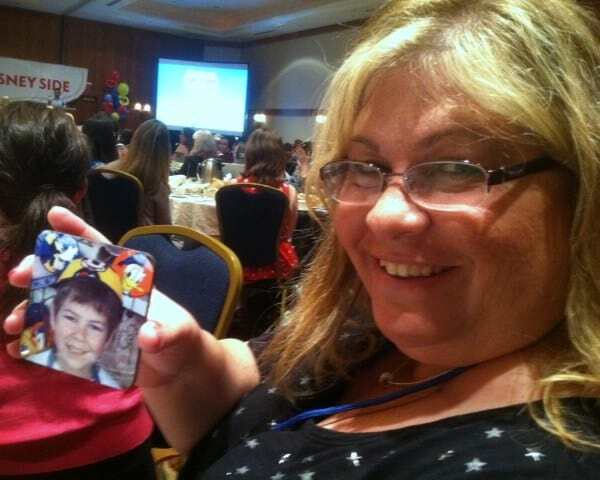 Terri won from HP a set of coasters with her son’s Disney Side photo on them! Lucky!! All of the attendees were given a picture postcard of the Disney Side photos that we submitted, along with an HP photo card pack. How nice is that? 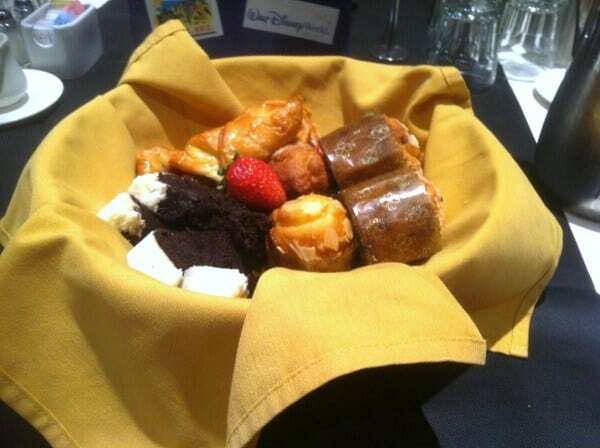 About halfway through the 5 hour conference, they sent out servers with trays of these cookies. They were so good! I actually brought it home to my son but he was gracious enough to share it with me. Good kid, that boy! And the Pièce de résistance of the day?? Why, Mickey Mouse of course!!! Everybody was so excited to see him. 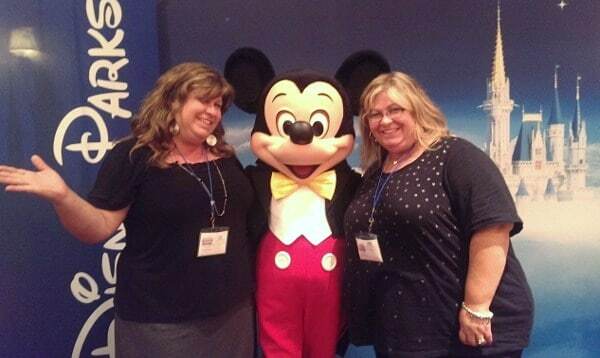 Terri and I felt like kids again and couldn’t wait to get our picture taken with him. Isn’t he cute? I tried to pose like him, but nobody does it like Mickey himself. Had to take a few more selfies with the Selfie Street sign before we headed back to Frederick. Thank you to Disney, BSM Media, and all of the speakers and organizers for a fantastic first experience! 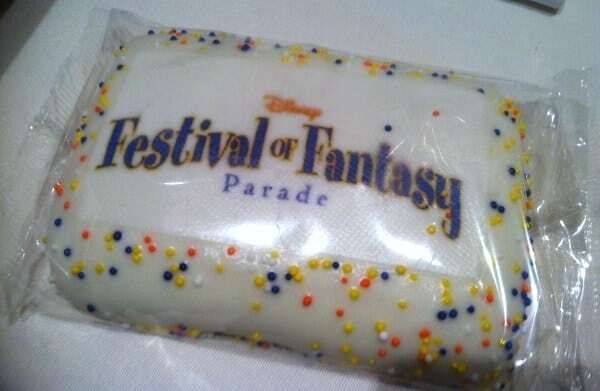 And I’m sure you’re curious as to what we got in those swag bags? Well, here it all is. We got 2 In The Raw grocery bags, a nice tote bag from Disney Social Media Moms, a cool Mickey figurine, 2 social media themed signs: Snow White saying ‘I Have Seven Followers’ and Donald Duck saying ‘ I Don’t Tweet, I Quack!! !’, a Mickey Mouse chocolate covered rice krispy treat, a cool scoop from MomTV.com, a Disney Social Media Moms lanyard, a 4-pack of GoGo Squeez Applesauce On The Go (which by the way has finally gotten my son to try applesauce and he likes it! ), a Mickey Mega Puzzle, a pen from Huggies Mom Inspired, a pin, tattoo, & Coppertone sunscreen, and a Disney pin. Wow! 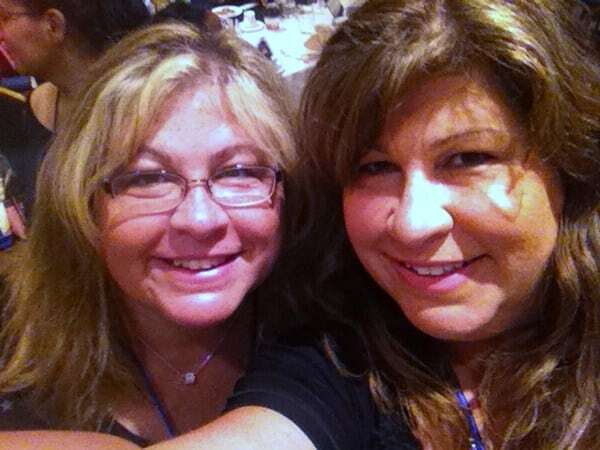 What a great first blogger/social media event experience Terri and I had! Here’s to more like this one. They certainly have raised the bar, that’s for sure! Wow, I had no idea how big this conference was. It looks like a lot of fun and a lot of good information. 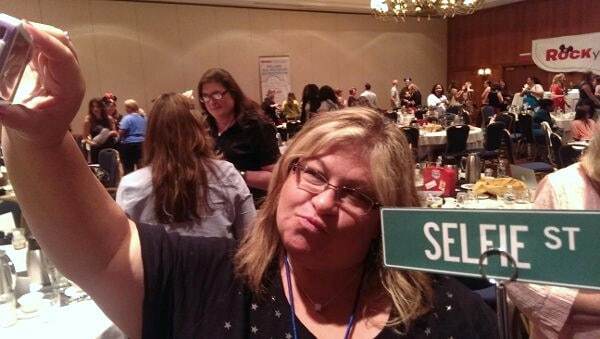 My favorite sign was the Selfie St. one too!!! I also got a kick out of Hashtag Highway!! What freaked me out was the information from Nora about HP, etc.–way over my head but so cool! I know, Cheryl – it is so tough to keep up with all of this technology! We felt so lucky to have been a part of this conference!